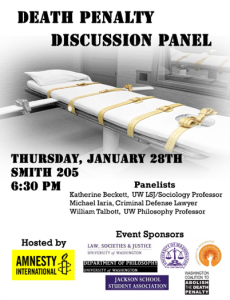 Join Amnesty International UW on Thursday, January 28, 6:30 pm at Smith 205, UW for an engaging discussion panel on the death penalty. Is the death penalty cost effective? Does it really reduce crime rates? These questions will be explored along with many others. Come with your own questions, as there will be time for the audience to participate. SNACKS will be provided, and there will be a RAFFLE for a secret prize! Michael Iaria is an award winning criminal defense lawyer based out of Seattle. With over thirty years of experience, Iaria has been selected by his peers as one of the top 100 trial lawyers in the state. Iaria has worked on death penalty cases since 1989. William Talbott is a UW Philosophy Professor and has field interests in human rights, moral philosophy, and philosophy of law. Among other books, he is the author of “Which Rights Should Be Universal?” At UW, Talbott teaches courses such as “Philosophy of Human Rights” and “History of Modern Political Philosophy”. This event is organized by the student organization, UW Amnesty International. This entry was posted in Amnesty International, Death Penalty. Bookmark the permalink.